Education: Phd, U of Wisconsin-Madison, 1996; MA, U of Wisconsin-Madison; AB, Franklin and Marshall College. Areas of research or interests include: American literature (with a specialty in nineteenth-century American literature, especially women writers and feminist theory), contemporary popular culture, especially television, horror, and westerns. Dr. Bernardi is also working on a book on American women writers in Italy and has co-edited a book titled Our Sisters' Keepers: Nineteenth-Century Benevolence Literature by American Women. 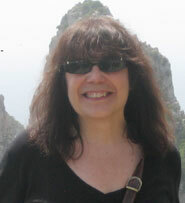 She has also published numerous essays, and writes movie and television reviews and columns for a local Helena paper. "Because Carroll is small, I get to work with our students over a number of years, seeing them in several classes. This way I really get to see my students grow and develop intellectually." "Our students read their work, along with other students and professional writers, at the Carroll Literary Festival ; they also can have their work published in our literary magazine Colors (there is usually a reading in town to celebrate the publication). I also encourage students to present their work more widely: this year a recent graduate and I are both reading our essays at a popular culture conference in Albuquerque, New Mexico." Required of all majors and minors in English, this course acquaints students with literature as both an academic discipline and an art by developing the analytical and critical skills required for more sophisticated readings of literary works. By studying the literary techniques of exemplary authors, students also discover ways in which attentive reading might stimulate and guide their own writing. Along with introducing students to the vocabulary and methods of reading literary works from psycho-analytic, feminist, historicist, reader-response, and other critical perspectives, the course provides training and practice in writing literary exposition. This course will introduce students to the basic reading and analytical skills needed to understand and appreciate literature. Students will become familiar with reading different literary genres (prose, poetry, and drama) and learn to use basic terms and techniques of literary analysis. They will develop multiple interpretations and responses to literary texts and support their interpretation and responses with textual evidence, both in discussions and writing. Also, they will discover how texts communicate cultural values and ideas through a variety of approaches to the reading and appreciation of literature. Offerings each semester range from an overview of literature through conventional genres to exploration of a limited historical period or topic in literature. This course will introduce students to the basic reading and analytical skills needed to understand and appreciate literature. Students will become familiar with reading different literary genres (prose, poetry, and drama) and learn to use basic terms and techniques of literary analysis. They will develop multiple interpretations and responses to literary texts and support their interpretation and responses with textual evidence, both in discussions and writing. Also, they will discover how texts communicate cultural values and ideas through a variety of approaches to the reading and appreciation of literature. Offerings each semester range from an overview of literature through conventional genres to exploration of a limited historical period or topic in literature. Fulfills writing intensive requirement. A study of major currents of nineteenth-century literature of the United States, from the antebellum period, through the Civil War, to the very beginnings of the twentieth century. The course may explore any of the following literary movements: the Romantic movement, including Transcendentalist writers and philosophers (e.g., Ralph Waldo Emerson and Henry David Thoreau), as well as the writers of the Romance fiction (such as Nathaniel Hawthorne and Herman Melville); mid-century domestic fiction (including such writers as Louisa May Alcott and Harriet Beecher Stowe); slave narratives (Harriet Jacobs and Fredrick Douglas, among others); and American Realism, including major proponents of realism at the end of the century, such as mark Twain, William Dean Howells, and Henry James, so-called "local color writers," such as Sarah Orne Jewett and Mary Wilkins Freeman, and turn-of-the-century naturalist writers such as Frank Norris and Theodore Dreiser. A study of early twentieth-century American literature (called "modernism"), from World War I through the 1930s. The course explores the work of white modernist writers (many of whom were part of the expatriate community in Paris during the period) alongside that of the African American writers of the same period who lived in the United States and participated in the movement known as the Harlem Renaissance. Among the writers studied may be Ernest Hemingway, F. Scott Fitzgerald, Langston Hughes, T.S. Eliot, H.D. William Faulkner, Zora Neale Hurston, Claude McKay, Nella Larson, and W.E.B Du Bois. A study of literature written by women, exploring what it means when women become the center of their own stories. The subtitle of the course will help define the focus: it may focus on writings by women from Britain, the U.S., any ethnic and/or national group, or a combination of any of the above. The course may focus on one century, a more limited historical period, or span several. Feminist literary and cultural theory may be an added focus. Writers may include: Jane Austen, Edith Wharton, Kate Chopin, Virginia Woolf, Adrienne Rich, Maxine Hong Kingston, Toni Morrison, Louise Erdrich, Sandra Cisneros, Gloria Anzaldua. A study of the history of African American literature. The course begins with early writings by slaves (these may include Phillis Wheatley, Frederick Douglass, and Harriet Jacobs); moves through the nineteenth century to study the Harlem Renaissance writers of the early twentieth century (including W.E.B. Du Bois, Langston Hughes, and Zora Neale Hurston); continues into the twentieth century to investigate post-World War II works (by such writers as Ralph Ellison, Lorraine Hansbury, and Gwendolyn Brooks); and ends with investigating contemporary African American texts (these may include novels by Toni Morrison and movies directed by Spike Lee). A preparation for students to write within the larger academic community. Students study conventions of effective writing for various types of academic essays, including research papers. Includes instruction in online and library research. Placement determined by score on national exams or passing grade in ENWR 101. The English Capstone Workshop is a writing course in which advanced English majors practice professional writing and presentation skills and aid one another in the further development of these skills. The course is required for all English majors who are in the last fall semester of study before graduation. Members of the class plan the Carroll College Literary Festival, held on campus in November; they propose, organize, and coordinate sessions on subjects of interest in literature, writing, and English Educatio and they issue calls for papers to English majors and other interested parties for presentation at the conference. Students then spend the semester writing senior projects, regularly subjecting submitting drafts the texts they are working on to intensive workshops by the other members of the class. They then present portions of their final project at the literary festival. A study of literature written by women, exploring what it means when wom en become the center of their own stories. The subtitle of the course will help define the focus: it may focus on writings by women from Britain, the U.S., any ethnic and/or national group, or a combination of any of the above. The course may focus on one century, a more limited historical period, or span several. Feminist literary and cultural theory may be an added focus. Writers may include: Jane Austen, Edith Wharton, Kate Chopin, Virginia Woolf, Adrienne Rich, Maxine Hong Kingston, Toni Morrison, Louise Erdrich, Sandra Cisneros, Gloria Anzaldua.